Here are this week's 10 most intriguing statistics from the digital marketing world, including a trio of basketball-driven data points as the NBA season is upon us. Check them out below. 1. That Matthew McConaughey SNL parody actually helped Lincoln. Amobee looked at the impact of Jim Carrey's merciless skit from last weekend in terms of digital content and social media impressions. According to the company's data, Lincoln saw impressions jump 103 percent from Oct. 25 to Oct. 26. Amobee said the boost represented the car brand's highest peak of online mentions in the last three months, and was 86 percent higher than normal for the marketer. 2. MJ builds buzz. The Charlotte Hornets turned over their Twitter handle to the incomparable hoops legend, Michael Jordan, on Tuesday, attempting to stir up excitement for the new NBA season. Jordan, who played for the Chicago Bulls but is now a Hornets owner, helped lift the team's Twitter following by 25,300, according to team reps. The Hornets exceeded 300,000 followers with the endeavor, celebrating a 9 percent lift in a single day—during which they also won their game versus Milwaukee. 3. 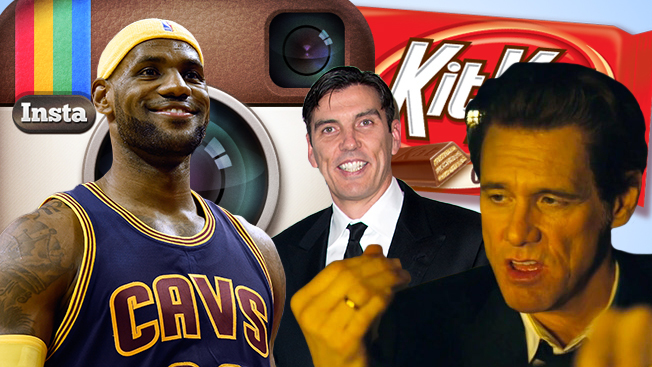 King James goes home and provides slam dunks for sponsors. Per 4C's report this week, LeBron James' return to Cleveland has aided his brand immensely. But that's only the beginning. The data company's research shows that, since LeBron revealed he would play for his home state team on July 11, his sponsors have seen huge boosts in before-versus-after positive engagement on Facebook. Here are the brand lifts in terms of consumer interactions on the social platform, according to 4C: Dunkin' Donuts (+ 6,016 percent); Beats by Dre (+ 5,861 percent); Nike (+ 4,736 percent); Coca-Cola (+ 4,128 percent); State Farm (+ 1,280 percent); and Samsung (+ 1,017 percent). 4. AOL's grind toward a programmatic foothold continues. The two-decade-old Web player announced a new cross-device ad targeting system this morning called One. Early test brands such as Citi, T-Mobile and others have seen a 30 percent increase in the effectiveness of their ads, with a $55 cost per action dropping to $35, according to AOL. 5. Even for Taco Bell, this development looks to be on a fast track to success. The quick-serve chain introduced a mobile order app this week, while cleverly promoting it with a "social media blackout." The anti-social strategy apparently worked wonders. The brand self-reported that 75 percent of its locations nationwide got a mobile order in the app's first day. 6. There are at least 204,086 sugar-minded "tweet ghosts" out there. That's how many mentions KitKat has gotten on Twitter from Oct. 1 through Oct. 29, making it the No. 1 Halloween candy brand on the social platform, according to Crimson Hexagon. Snickers was second with 145,836. 7. Instagram hashtags help quite a bit, #thankyouverymuch. Instagram posts with at least a single hashtag average 12.6 percent more engagement, according to Simply Measured. 8. Like speed in sports, location kills in marketing. From the same Simply Measured study (click here to glean more data): just 5 percent of Instagram posts tag a location, but the ones that do use this feature get 79 percent more engagement. 9. Smartphone-based ads continue to anchor Facebook's growth. In fact, mobile represented roughly 66 percent of its ad revenue in the third quarter. Comparatively, mobile accounted for 49 percent of ad sales during 2013's Q3. 10. Psyched for some roundball. Google claimed that searches made for the keywords "NBA season" have increased 400 percent since July.